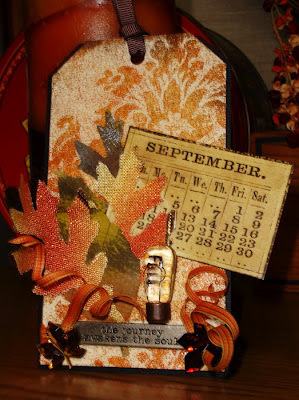 Studio L 3 this CC2 Challenge 20 using Tim Holtz: A Compendium of Curiosities, Vol. 2, page 44. Book, I recommend this technique very much. 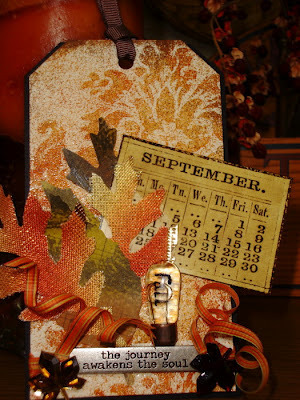 My Background stamp is from Tim’s (Textiles CMS 023) the large Tattered Leaves Die (which they were cut from fall ribbon) as well as from Kraft Resist paper. I also use Word Bands that I added Black Adirondack Acrylic Paint too. The small calendar is from Tim’s Salvage Stickers. I’ll try hard to be on time next time, so thanks for letting me play along. That textile stamp is gorgeous Vada. Definitely Autumn in the air in my part of the world. You aren't late! You finished with hours to spare! Ha! I only finished mine yesterday! 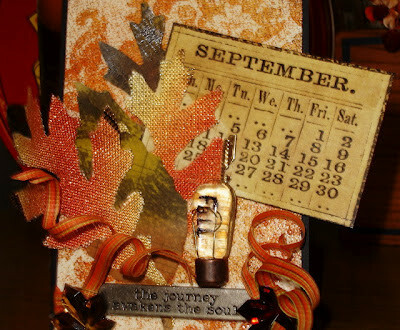 Loving those Fall leaves and that enameled background is gorgeous! Very cool how you displayed the word "Fall." Love this, GF! Big Hugs! Wow, Vada, this is just gorgeous. it's my favorite crafting season and this is such a delight for the eyes! Those leaves are stunning! Did you know that you won a $25 gift certificate to the Funkie Junkie Boutique from the Resist challenge? Please email me at thefunkiejunkie@gmail.com so I can give you your coupon code. We have a 10% grand opening sale coming up this weekend at my new shop and you can use it then if you wish! Congratulations and thanks for playing with us at Frilly and Funkie! That curled up ribbon and fabric are such great elements with the neat stamping technique... love it! Great tag Vada! Love all the fall colors, and that curled ribbon was a great touch! I can almost hear those leaves crunching under my feet. What a Gorgeous fall card Vada.